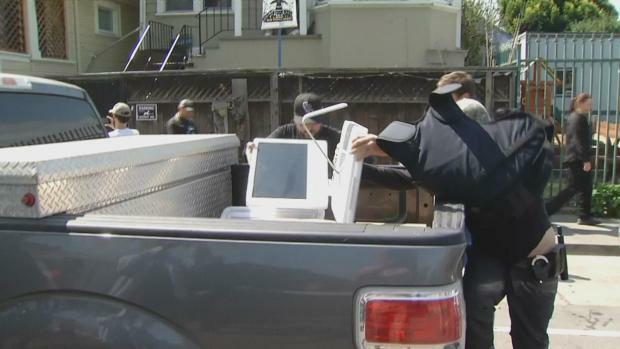 West Oakland residents on Wednesday booed ICE agents, who police say were serving a federal search warrant for human trafficking. People who gathered shouted, "No ban, no wall!" Community activists unleashed their fury on agents with Homeland Security Investigations — part of U.S. Immigration and Customs Enforcement — who, police said, served a federal search warrant related to human trafficking in West Oakland on Wednesday morning. The operation began around 6:30 a.m. on 27th Street, near West Street. Law enforcement officers were at the scene for hours. Although ICE officials remained tight-lipped, Oakland police said they were looking for suspects in an alleged human trafficking ring that is targeting juveniles. However, Laura Barrios, whose house was raided, claims investigators are looking into their family-owned janitorial business, and at least two undocumented family members from Guatemala were taken into custody. A tense situation unfolded as agents, who filed out of a house with boxes of evidence, were confronted by an angry crowd. People yelled "Boo" and chanted "Shame." Lucas Solorzano, with the Alameda County Immigration Legal and Education Partnership, said it's up to communities to protect their own. ICE agents are not welcome, he said. "This is the political climate we're in right now," he said. "It shows how important community defense models are right now, how we need to be able to defend community members." Near the house where the federal search warrant was served, messages scrawled in chalk on the sidewalk offered insight into the neighborhood's views on the city's police department and ICE. "We (love) our neighbors," "Get ICE out," Don't talk to cops" and "OPD is a disgrace" warred with "Oakland is not a sanctuary." Community activists unleashed their fury on agents with Homeland Security Investigations — part of U.S. Immigration and Customs Enforcement — who served a federal search warrant related to human trafficking in Oakland on Wednesday morning. Laura Malpert reports. In fact, Oakland is a sanctuary city, but police Chief Anne Kirkpatrick authorized officers to provide traffic control after HSI on Tuesday requested their assistance. He continued: "And then there's Homeland Security Investigations. That's our criminal investigation side." Additional information is unlikely to be released Wednesday, but more details might be available Thursday, according to Schwab. "It's an ongoing investigation," he said. "They're going to have to go through everything."